Note: This tag is a little overdue so I thought I’d post it ahead of my weekend food jaunt entry. Soon-to-be-blushing bride Daphne, of My Little Moments tagged me with this Valentine’s Day meme last week, that has the color RED written all over. 1. Post your photo wearing red, may it be a red top, bottom, the least would be red accessories if you hate wearing red… If you can’t find one, you still have an option…. Either post your Significant Other’s photo or your child’s photo, if you have one. Of course, they should be wearing red. 2. Let us know the reason why you were wearing red that particular day. Was it your birthday? Is red your fave color or was it the shirt that you first saw in your closet that day? 3. Tag 3 people close to your heart. By the way, they have to be in your blogroll. No cheating heart please. 4. Once you’re tagged, please keep it going – just for this month. It took me quite a while — not to mention, a bit of effort — figuring out how to best answer this latest tag from the future missus of the still mysterious Mr. D. Not because I can’t, but simply because I don’t recall having any photos of myself wearing red among the handful of pictures I have in my possession, let alone having a bloody red-colored shirt or… *shudders* pants in my musty smelling wardrobe. The other option — as stated in the above mentioned rules — doesn’t apply as well since I have neither kids running around the house nor a “significant other” to make babies with. In lieu of the necessary requirements (kids, significant other and red outfit) to complete the meme, I will instead post a picture of my three nieces, taken with my N-95 camera phone sometime last month, during a baptismal/children’s birthday party thrown by a cousin inside the clubhouse of a swanky subdivision somewhere in the Metropolis. The red shirted girl behind the two cuties is Karine, my sister’s eldest daughter who at only 10 years of age, already stands at 5 feet 2 inches tall — and obviously, still growing. I wouldn’t be surprised if in a few years time, she’ll outgrow everyone in this family. 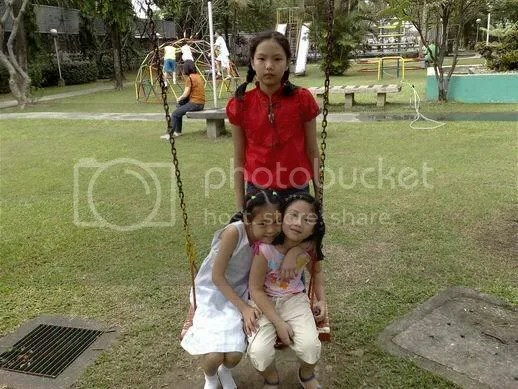 The lanky one on the swing with her arms around her little cousin is Karine’s temperamental 8 year-old sister Carla. And last but not least, there’s the camera-loving Samantha, my kid brother’s only child at the moment. Great, now I get to pass on this meme. But instead of the three that is being asked of me, I decided to tag the four ladies with whom I had dinner with a few weeks ago, namely, Beng, Carla, Jen and of course Verns. PS: I just realized something, just now, while typing this entry. Today, being the third anniversary of my Dad’s passing, also happens to be Karine’s 10th birthday.